GE. ანცი გოგონა მანანა თავის ნებაზე ათამაშებს მოხუც ბებიასა და ბაბუას, რომლებიც დედის სიკვდილის შემდეგ ზედმეტად ანებივრებენ შვილიშვილს. ბავშვი გაკვეთილებს აცდენს, მამას, მეზობლებს და ამხანაგებს ატყუებს. საკუთარ ტყუილებში გახლართული მანანა ყველას უსიამოვნებაში გარევს და მიხვდება, რომ ასე გაგრძელება აღარ შეიძლება. ის პატიებას ითხოვს და პირობას დადებს, რომ ამიერიდან სამაგალითო მოსწავლე გახდება. EN. Old Georgian funny comedy on the theme of "what is good and what is bad," a summary of the network: since his wife died of sea captain Sergo, grandparents endlessly indulged his nine year old daughter Manana. To forgive her all pranks and even deception. One day, to take time off from school early, she invented that grandparents are very sick. After school classmates came to Manana, to help a friend in trouble. The news of the illness of parents came up to Manana's father, who left an urgent job, hurried home. But it turned out to be cheated. After this act people stopped believing girl. And she felt: a person hard to live when he does not believe. And she had to completely change their behavior. Directors: ზაქარია გუდავაძე / Zaza Gudavadze, შალვა მარტაშვილი / Shalva Martashvili. 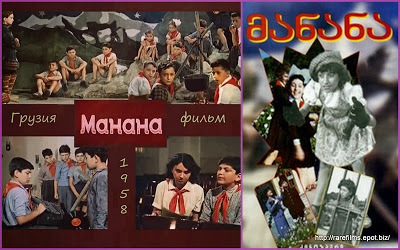 Cast: Nanuli Sarajishvili, Sesilia Takaishvili, Aleksandre Jorjoliani, Yakov Tripolsky, Medea Chakhava, Ipolite Khvichia, Lamzira Chkheidze, Aleksandre Kuprashvili, D. Kuchaidze, Revaz Baramidze, Zaza Gachechiladze.